The people of San Francisco deserve to have their jewels polished!" I believe Tony was speaking about the Conservatory of Flowers when he made the above statement. Still, it holds true across the spectrum. Tony wasn’t the only one thinking of the Conservatory this week. Chronicle columnist Ken Garcia seemed to have taken an entire bottle of Viagra before doing another column attacking District 5 Supervisor Matt Gonzalez in the February 9 Chron. Lemme give you the details. Garcia, like the SF Weekly’s Matt Smith, is a lackey of the bluebloods. Garcia twists & distorts simple facts to such a degree as to make up seem down & good become bad. In the column Garcia leads his readers to believe Gonzalez wants to shut down the road in front of the Conservatory of Flowers permanently. It takes Kenny Boy over a thousand words before he gets around to noting that the closure is only for Saturdays and is in response to the fantastic success of the Sunday closure that has taken place for more than 20 years, covers four times the road & accounts for 96 percent of Golden Gate Park visitors on that day. Garcia’s bosses are in the minority here. The public hearings that were televised on Channel 26 (the poor man’s version of the WWF channel) pitted a few rich people and Willie’s special assistants against hundreds of plain ole average folk. The rich always lose in debates before the various commissions and committees but eventually they get their way. 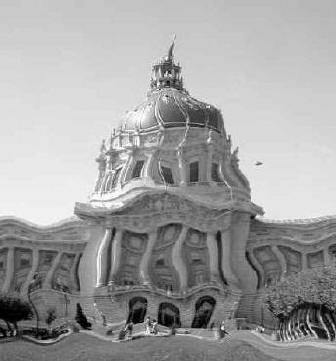 In one of the de Young hearings, a woman brought her servants to testify bouts whys we needs this ugly phallus protruding from our park. One servant forgot what she was there for & went into a little speech instead about how long she’d kept house for this woman who brought her here & anything she said must be ok. … I mean, jeeez, Ken. The reality is that poor people make rich people uncomfortable. The poorer you are, the more uncomfortable they become. Small wonder that the rich have decided to pretty much lay claim to sole title on Golden Gate Park Stables, Harding & Fleming Golf Courses, and all the parking (they’ll take away your free parking above ground & allow you to pay to park in their private garage). 1. Allow facilities to deteriorate. Siphon profits back into General Fund where the mayor controls 99.7 percent of expenditures. Thus, money that could be spent keeping stables up to snuff ends up funding salaries of mistresses and bootlickers. 2. Evict present tenants/users. Toss out horses, golfers, kids, poor, boats, juveniles (case of Juvie Hall below), old. Use deterioration from Step 1 as excuse to clear facilities. 3. Spend obscene amounts of money (provided through public bond measures) & and let all contracts go to friends & friends of friends. Make every measure out to be emergency. Use words like “security”; talk about “world-class” facilities. 4. Re-open facilities under 50-year leases to political cronies & their pals. Let them charge minimum of triple previous charges for everything from drinks of water to rounds of golf. 5. Take break. Call chicks. Firm up reservations. Hey, this is easy. Politics, the mayor has often said, are his life. Speaking of rip-offs, you been watching the slithering boa constrictor of the Juvenile “Justice” System lock up the city’s kids? Now, there’s a hedge that needs pruned. Even though the population of kids is down some 20 percent in the city, we need a bigger lock-up for them because we’re locking more of them up than we used to. Fella testified that whereas ten years ago we only locked up 36 percent of the kids who got busted, now we’re locking up 85 percent of them! Whoooa! Despite all of the new programs that Kimiko got funded by the mayor & her daddy, the kids are worse? Do the math. Twenty percent less kids get locked up over twice as often. That would seem to indicate that the kids are about three times as lethal. Don’t get upset. It’s not true & they know it. They’re only saying that … surprise, surprise, surrrprise (as Gomer used to say) … to spend 50 million or so of taxpayer money to build a bigger building they don’t need. First, of course, they’ve got to tear down the old building which at 40 years old is deemed ripe for a profitable turnover. Like the docks & the stables & the golf course & the Trans-Bay Terminal etc. etc. The city has allowed the building to deteriorate in order to strengthen Willie’s case for replacing it. Like so many other plans (say, the Airport), Willie hasn’t waited for approval to begin spending the cash. The January 29th meeting of the Economic Vitality, Small Business & Social Policy Committee heard testimony that the city had spent over 20 million on “Juvenile Justice Reform” over the past five years. Musta been using cash to hire the mayor’s block captains at 50 to 100 grand a crack. While the streets remained filthy, Willie appropriated 7 million bucks last year for replacing the old Juvenile Hall & they’ve already spent 2.4 million on architects & consultants & the like on a building that, hopefully, will never be built. All that money, all that grease, all that payola should go into funding free city parking for 2,000 mentors/job coaches who agree to teach a kid (who is also paid) a couple of hours a week. Chance? Absolutely none. Willie would rather see your money go to Bechtel & the like. Ford knows the truth will come out & he does damage control in advance. Kind of like Kimiko Burton & the 200 grand in salaries for her new special assistants who were brought on because either (a) she cannot do the job the mayor appointed her to & must have two high-paid assistants plus herself to do the job Adachi did alone, or (b) she’s added one hundred-grand pork-barrel position & doubled another position to almost a hundred grand to pay off her dad & Willie for the appointment. Like our Harrison Ford character, Burton offered a quick pre-emptive comment on the excess patronage pork she’s made line-item for next year’s budget. “I’m proudest of establishing a position of finance director.“ The other new hire was her husband’s old secretary. But, hey, that’s probably just a coincidence. Nope, you’re not gonna get me down in the mud saying she’s just another spoils politician like her pop & Willie. Nope, I think more of her than that. I’m gonna go with answer (a). She’s not dishonest. She’s just incompetent. Take heart, Jeff Adachi, they might uh run you off but it took three people to replace you & even those three do it badly. It seems that lots of people are going to be spending time before & after the coming election replacing the page of the ballot which includes the vote for Adachi/Burton. It falls under what they call “remaking.” Seems that you’re only allowed to remake ballots if (a) they are damaged or for some other reason cannot be counted by the machine; or (b) your candidate is losing. Last election, they did tons of these remakes behind closed doors when da law say they gotta allow public oversight. Thisa time theys promising we can watch. I’d guess you got a better chance playing Three Card Monty at 6th & Market. I wonder if the ballot page the “remakers” are replacing will have the same numeric designation as the front page? Save your ballot receipts like they’re lottery tickets. I’m guessing you could learn that even though thousands of you voted for Jeff Adachi, that page of your ballot got deep-sixed & your vote was recorded as being for Burton. Oh, & did you know you were also against term limits & thus in favor of Father John Burton staying in Sacramento forever (not that bad an idea). I am, I do believe, the only person who watches Channel 23’s News Desk Show (various times around dinner) every week. Watching print journalists in front of a camera is kind of like stumbling in on your great grandma naked. It’s a bit embarrassing. Still, it beats “remaking” ballots for a living, I guess. Part of the show is an interview period conducted by a little right-wing wuss named Bruce (the bunny) Petit. You watch, you tell me if I’m wrong. Petit has the presence of some small furry thing that should be parting the bushes to peek in on the campfire. No matter. He (or his producers) do give some face time to my candidates and for that, I am grateful. Still, the man should do at least a little research before he does his interviews. His interview with 6th District Supervisor Chris Daly is a case in point. Petit had no idea whatsoever of Daly’s eight years of work in the homeless community. He seemed surprised to hear that Daly came from another location in the United States & moved here specifically to work with the homeless. Without so much as a note, Daly worked his way through pertinent details in the city’s Continuum of Care – the official city map for dealing with the poor, insane & addicted who inhabit our streets. It was like Petit had invited Genghis Khan to dinner & Gregory Peck showed up. He expected an inarticulate beast & he got an informed, passionately committed wonk of the homeless. I’m still looking for a 2nd District residence. Nothing fancy. I can garden or paint or manage property. I just need to bed down in the Marina or Pacific Heights till the second week of November.